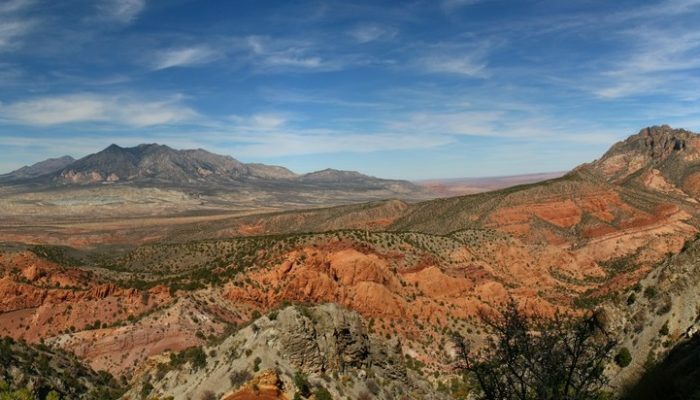 In 1877, the United States Geological Survey published a report “On the Geology of the Henry Mountains”, on the small range of peaks in southern Utah, pictured here. Up to that point, little scientific study had been made of the unassuming peaks, but the author of the report, one Grove Karl Gilbert, not only detailed the structure and mineralogy of the landscape, but in doing so also laid the foundations for much of modern geomorphology. While beautiful, the range is isolated and of limited economic value; Gilbert himself notably wrote that “No one but a geologist will ever profitably seek out the Henry Mountains”, while the name given to the range by the Navajo Nation is Dził Bizhiʼ Ádiní, literally meaning “mountain whose name is missing”. And yet, the wildness of the range is sufficient attraction for some! Snippets of our planet’s ancient past are frozen in rocks around the world. By studying the information locked in formations across the globe, geoscientist unpick the history of Earth. Though the layers in today’s featured image may seem abstract to the untrained eye, Elizaveta Kovaleva (a researcher at the University of the Free State in South Africa) describes how they reveal the secrets of ancient winds and past deserts. In summer 2016 we toured the Western US in a minivan. We visited many of the gems of Utah, Arizona, and New Mexico, such as Monument Valley, Antelope Canyon, Grand Canyon, The Arches, Bryce Canyon, White Sands Monument… But the most precious and memorable for me was Zion National Park in Utah. This canyon is a unique and special place. First, because you access it from the bottom, unlike most of the other canyons, which you observe from cliff tops, such as the Grand Canyon. Thus, as you drive along the road, leading into Zion National Park, you look upward into the magnificent cliffs and rock temples. Small hiking trails lead up to waterfalls, arches and breathtaking views. The cliffs of Zion National Park are built of Navajo Sandstone and display aeolian deposits, which have been shaped by winds, on a massive scale. They are the remnants of an ancient fossil-bearing sand desert, one of the greatest and largest wind-shaped environments that has ever existed on Earth. In the Early Jurassic, up to 200 million years ago, the Navajo desert covered most of the Colorado Plateau (which today includes the states of Utah, Colorado, New Mexico and Arizona). Fossils, found in these sand deposits, include ancient trees, dinosaur footprints and rare dinosaur bones. In Zion National Park, the thickness of sand deposits reaches 762 m. Beautiful cross-beds are cross-sections through fossilized towering sand dunes. They indicate the direction of the ancient winds, which were mainly responsible for moving and accumulating the sand in the Navajo desert. 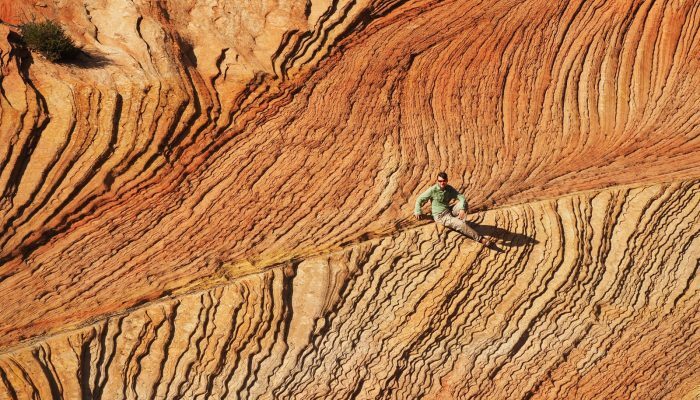 On the top, the Navajo sandstone is abruptly truncated by a regional unconformity, which indicates the erosion of the overlying sediments, and is covered by Middle Jurassic sediments. In remains unknown how much of the Navajo sandstone was eroded from the top of the formation during this weathering episode. It might be that the thickness and height of the Navajo sand dunes used to be even more impressive than it is now. The cliffs of Zion National Park. 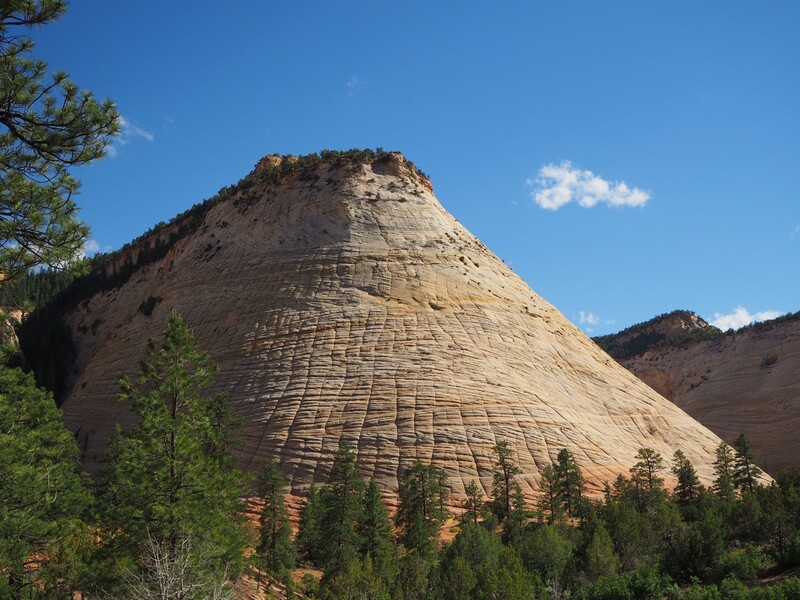 Pictured is Checkerboard Mesa (South-Eastern entrance to the Zion National Park. Credit: Credit: Elizaveta Kovaleva. Movement of ancient sand is one of the winners of the 2017 Imaggeo Photo Contest. Ron Blakey and Wayne Ranney, Ancient Landscapes of the Colorado Plateau, Grand Canyon Association, 2008, p.156.